As the church calendar nears the celebration remembering the recovery of the most precious cross which once bore our Saviors body, we remind ourselves that the pagans were once again defeated in their effort to hide any memory of Christ. Even after burying the cross deep in the Earth the Roman Emperor Hadrian erected a Roman pagan temple to the goddess Venus and once finished, 300 years of pagan sacrifices were offered there. The Empress St. Helen in 326 had the pagan temple destroyed as she bleached Jerusalem, the city of peace, of its pagan whores and the precious life-giving cross was recovered as well as the other two crosses of the thieves; that which brought life in abundance could no longer be hidden. St. Helen found a rare fragrant flower growing there which has been named “Vasiliko” or Basil which means “of the King”. 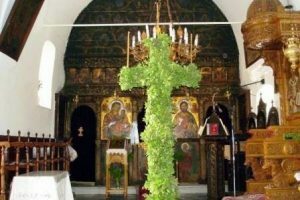 Underneath this Basil the true Cross was found as well as the sign with inscription which read “Jesus of Nazareth, the King of the Jews” and also the four nails which had once pierced our Lord’s body. To this day, we adorn the Holy Cross with fragrant Basil, a flower of royalty, reminding us of this event. Whatever sins keep tempting you over and over again can be defeated at the foot of the Precious Cross. The One who sees and knows everything about you is here with you fighting for your salvation! You are not alone, you are loved! Not the kind of human love filled with insecurities and demands but a Divine Love that is perfect, an uninhibited love that defeats death by death, and a love so rich that it took the keys to Hades, shut and locked the door and freed its captives. Glory to Thee Oh Lord, Glory to Thee!!! Next Next post: YOU’RE A KEEPER!